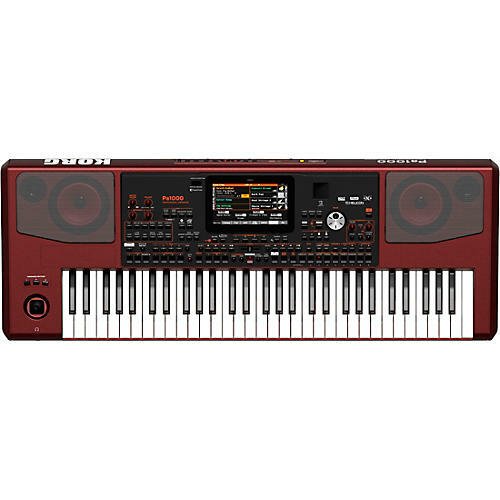 A member of KORG's acclaimed Pa-Series of Professional Arrangers, the Pa1000 is a high-performance arranger with plenty of new sounds (featuring Defined Nuance Control for enhanced realism) which keep performances fresh and exciting, as well as an enormous expanded range of styles covering music genres from all over the world. Combine this with powerful performance functionality, an intuitive user interface and rich, sculpted sound and you have an Arranger for the most discerning and demanding player. The Pa1000 sound engine uses four times the PCM memory of the best-selling Pa900 and extends the amount of User PCM memory to 600MB using compression. The number of User Style locations has also expanded to a maximum of 1,152 which will cover almost every style imaginable. The improved built-in speaker system produces a strong, full-bodied sound that’s enhanced by standard features such as the TC Helicon Vocal Harmonizer, a Dual MP3 player & recorder, and the Dual Crossfade Sequencer. Video output is standardized, so your audience can sing along to the onscreen lyrics. The Pa1000 packs all this in a high‐quality case with aluminum inserts in the side-panels of an elegant chassis to provide a prestigious look on any stage. Totally new is the addition of KAOSS FX, which give you creative control on your performance. From subtle morphing between Variations and Drum Kit types, fine mixing between accompaniment Sounds, live reshaping of ongoing rhythms, to the most radical note-crunching effects used by countless DJs, tape delay and arpeggios, you can add ‘liquid mixing’ to any Style or MIDI Song with the aid of easy-to-use computer-assisted composition features. Push the boundaries of your musicality. With more power than ever before and numerous long-awaited new features, the Pa1000 sets a new standard for arranger workstations. A massive leap forward from the legendary and best-selling Pa900, KORG has raised the bar of excellence by offering newer, even more realistic sounds and powerful new features, delivered in a slim and professional looking design, at an even more affordable price.